An electric dehumidifier allows you to control the amount of humidity in your room for maximum comfort. It protects your home from mold and mildew that can be caused by excess moisture. It can also help reduce or eliminate bacteria in the air, room odors and other airborne particles that can affect your breathing, for a healthier, more comfortable environment. It should be equipped with a removable and washable filter. It should alert you when your water tank nears capacity, and it is time to empty the water bucket. ​It should have easily selectable controls with the touch of a button. It should have caster wheels and handles, so that it can easily be moved from room to room. ​It should be equipped with a timer. This article will compare Frigidaire FFAD7033R1 and Keystone KSTAD70B electric dehumidifiers capable of 70 pints dehumidification per day. These were not just the most popular among Amazon customers at the time this article was written, but they had also received excellent reviews from most Amazon buyers (an average of at least 4 stars each out of 5 stars!). Selected Electric Dehumidifierss on Amazon. Both dehumidifiers are equipped wih electronic controls and LED indicators that show the various states the units is in. Both dehumidifiers come with an adapter (attachment) that allows adding a hose for continuous draining operation (note that the hose is not included with either product). With the Keystone dehumidifier, you will need to press the continuous control button to activate the continuous dehumidifying operation. For both dehumidifiers readout shows the % humidity set when setting the desired humidity level (35% to 85%), then it shows the actual % humidity in the room. For both dehumidifiers, when the bucket gets full the unit shuts off. Both dehumidifiers have a 24 hour on/off timer. The timer function of both dehumidifiers enables you to either delay start or delay stop the unit. If the unit is running, then selecting the timer function will turn the unit off in the amount of time that will be set. If the unit is off, then selecting the timer function will turn the unit on in the amount of time that will be set. The timer of both units can be set by 0.5 hour increments, up to 10 hours, then by 1 hour increments up to 24 hours. The low temp limit for both dehumidifiers is 41 degrees F.
For both dehumidifiers, the lowest possible humidity setting is 35% and the highest is 85%. Note that levels between 40-50% are in general considered ideal. For both dehumidifiers, the unit turns off when the set humidity level is reached and restarts automatically when the humidity level rises. If you set it to a specific humidity level, the unit will cycle off and on to maintain that level, until the tank is full. Also, for both dehumidifiers, if there is a power outage, the unit turns automatically back on at the last settings after power is restored. This is important if used while you are away for business or vacation. For both dehumidifiers, there is a limited one year warranty on the appliance and a limited 5 year warranty on the sealed system (the compressor, condenser, evaporator and tubing). So which of the two dehumidifiers is best for your home? The two dehumidifiers considered here are high quality products as shown by the average rating each had received from Amazon customers. Indeed, at the time of this writing, Frigidaire FFAD7033R1 and Keystone KSTAD70B had respectively received 4.5 and 4.0 stars (out of 5 stars). In addition, as shown by the feature comparison table above, they both come with the must-have features listed in the introduction to this article, and except for a few differences, their feature list is quite similar. Therefore, there is a good chance that you would be quite happy with either product. Frigidaire FFAD7033R1 comes with three fan speeds while Keystone KSTAD70B comes with two. Frigidaire FFAD7033R1 is equipped with a slightly larger bucket than Keystone KSTAD70B, meaning that it will take slightly longer before it needs to be emptied. Frigidaire FFAD7033R1 is slightly less noisy than Keystone KSTAD70B. 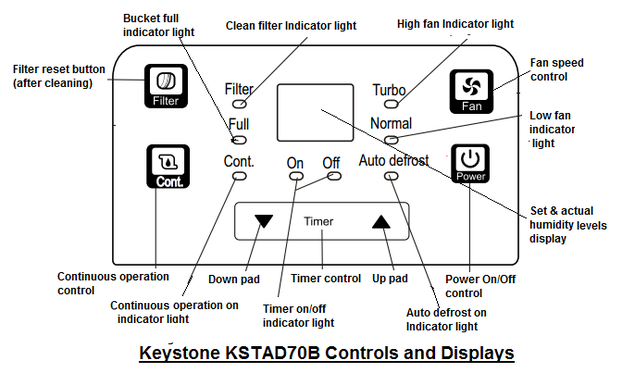 Frigidaire FFAD7033R1 allows locking the controls while Keystone KSTAD70B does not. Finally note that, at the time of this writing, Frigidaire FFAD7033R1 was the bestseller on Amazon in its category. 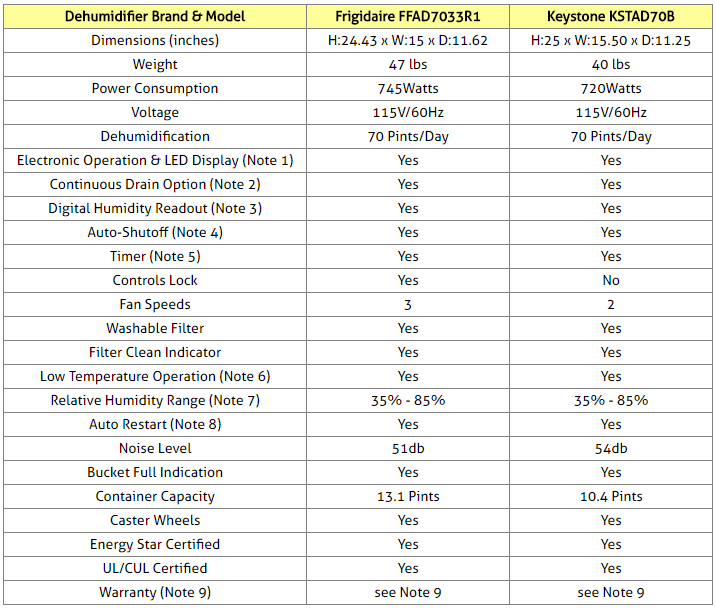 Please click the dehumidifier of your choice below for price information or to purchase.